Chimpanzees housed at the Chimpanzee Conservation Center (CCC) need your support to feed and care for them until it is time for their release. Many have already returned to the wild (see released chimpanzees). Toto’s story is different than all the other chimps at the CCC. First of all, he isn’t a Guinean but a Senegalese chimpanzee. We do have a few chimpanzees at the CCC who are from neighboring countries so that’s not why he is special. He is after all from the same sub specie (verus). What makes him special is that he has a different past: he is not a by product of the bush meat trade or the pet trade. Our Neighbor Ape organization in Senegal, rescued infant Fongoli chimpanzee Toto after his mother died of snakebite & no other group members found him. Toto was 2 months old at the time & wouldn’t have been able to survive on his own. He was cared for on site for over 3 years. He’s now a big boy and it was become urgent to find him a place in a sanctuary. Jill Pruez and Janis Carter approached the CCC and we agreed to take him in. Getting the CITES permits and raising the funds to build a suitable facility on site and to transport him took time but Toto will very soon be headed to the Chimpanzee Conservation Centre sanctuary in Guinea! His main caretaker will come and stay with him at the sanctuary from 3-6 months. Neighbor Ape’s support of Toto would have been impossible without the generous donations of donors like yourself and we are hoping that you will continue to support Toto in his new home. Toto will be integrated with our “big” babies group: Noel, Missy and Hawa. We believe that he will fit nicely although he’ll have to learn to be a chimpanzee and play nice. Toto is way bigger than any of our 3 kids so hopefully he’ll be gentle. 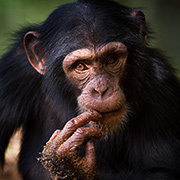 While they originally held out hope that Toto might be returned to his family group, given the changes associated with the gold rush and its associated influx of people as well as Toto’s very large size for his age, the possibility of reuniting him with the Fongoli chimpanzees was rejected as being too risky. We are very hopeful that Toto will settle quickly with his new friends and we will provide regular updates to neighbor ape and on our on social media pages. Kanda arrived at CCC in November 2015. When he was “dropped” of by the authorities he could fit in the manager’s hand. We estimated that he was just five-months old. He had no teeth and was at first very lost. In Malinke, the local language, Kanda means “protected”. We’re hoping his name will bring him better luck than he’s had so far. The organization GALF (part of the EAGLE network) seized both Kanda and Soumba (a female who arrived around the same time than Kanda) during an anti-poaching operation. It was a blessing for Kanda to be with Soumba who’s a bit bigger than him. At first he got 24h/7 care with substitute monthers. In February 2016, another female confiscated by the authorities, Adi, joined the pair. They are inseparable! Kanda is a very happy baby, with a love for life, and who loves the sound of his own voice. Given his young age, the long-term presence of his substitute « mothers » is essential for healthy growth and development and we’re looking at many milk and supplement bottles for him since chimpanzees are weaned only around 4 years old. Your support will help pay for his numerous bottle and his veterinary needs. Soumba is a young female who arrived in November 2015, along with Kanda. Immediately following seizure by GALF, Soumba had several infections, which we quickly treated. On arrival to the CCC, she was lethargic and depressed. Love and care from her substitute “mothers” are indispensible for reigniting her love for life and starting her on the long path of rehabilitation. The presence of Moninga, a two-year-old boy, is unique at our sanctuary. He was born on May 14, 2013 at the CCC and is the son of Loundan, a wild female and the only female adult at the sanctuary not using contraception. He was named by members of one of our partner organizations, the PAL Nature Foundation (la Fondation Le Pal Nature). Moninga means “friendship” in Lingala, a local Congolese language. This little guy has had the chance to grow up under the protection of a very attentive mother. He is extremely confident and is looked after by the entire “Grands” group. Like many of the chimps at the CCC Missy has had a difficult start in life. Poachers shot her mother and Missy underwent the traumatic experience of seeing her mother killed before being torn away from her lifeless body. She was taken to a town in Liberia to be sold as a pet. During her captivity she was bitten by a donkey. An expatriate discovered Missy and alerted the CCC. For the first few months with them, she was nursed back to health. On arrival at CCC, due to her young age and lack of knowledge of the bush, Missy required one on one care in a forest environment. Thanks to the efforts of all the staff at CCC she has begun to adjust well to her new life and her personality is starting to show more and more. She is learning many important vital skills in the bush such as climbing trees and discovering new wild food. Like all baby chimps she loves to be tickled and has begun to trust her new caretakers. Missy has recently had some interaction with chimpanzees, first with Sanka, a new arrival at CCC then with the nursery group where Sanka has been integrated. Although she still has lots to learn about chimp ‘etiquette’ she was very confident in her interactions (sometimes a bit too much considering her size and age!) and demonstrated a lot of natural behaviour which bodes well for her future with other chimps. Sanka went on with the nursery group while Missy was integrated with two new arrivals, Noel and Hawa. This group of “big babies” is a very happy and active group. They are being introduced with the nursery group right now. Missy is Tango’s favourite who wants to protect her! Missy needs your help so the CCC can continue to fund her care and development in the years to come. Please help Missy to put the past behind her and give her a brighter future. Arrested by GALF and Interpol, traffickers had planned to sell Noel and bragged about procuring many other baby chimps. Noel arrived at the sanctuary on December 23, 2014 (hence his name-Noel means Christmas in French!) and immediately displayed a strong knowledge of chimpanzee behavior and vocalizations. He adapted quickly to his new life at the CCC. He now spends his days in the bush with Hawa and Missy. Many squabbles between he and Hawa enliven the day! A joint operation between local authorities, GALF and Interpol led to the arrest of the poachers who took Hawa. Two weeks earlier, they had killed and eaten her mother in their village. Hawa, now an orphan, was on sale as a pet. In April 2015, Hawa joined the CCC and remained wary of humans with whom she was unaccustomed to living. On arrival, she had deep wounds on her hip due to the rope tied around her, and a great amount of psychological damage. Today, Hawa spends her days with Noel and Missy in the bush. Hawa teaches them some skills she learned while living in the wild, while Noel and Missy provide her with the love and support she needs to heal. She happily takes on the role of big sister to Missy. Leonie arrived on December 14, 2011. Leonie came from Sierra Leone, a country bordering Guinea, hence her name. A Sierra Leonean soldier had purchased her from a poacher and planned to resell her to a Guinean soldier. An official from Waters and Forests Guinea seized the little chimpanzee and arrested the soldier. Upon arrival, Leonie was quite small (3.5 kg) and had head wounds, a pellet under the skin of his left cheek and difficulty moving her leg and right arm. The right side of her body was almost paralyzed. Nearly 10 days after her arrival at the Centre, Leonie developed an abscess over the hole that was in her skull. After many treatments, her condition improved and she began to move better and be more alert. She regained movement of her leg and arm. Unfortunately, Leonie continues to suffer from complications that the CCC team makes every effort to treat. Leonie has a strong personality and has a real thirst for life despite her suffering. Labé arrived on July 1, 2012 following her confiscation in Conakry by the responsible GALF (Guinea – Applications Fauna Act) agent and in close partnership with the Guinean authorities. Labé came from the town of Labe in the Fouta Djallon. She was supposed to be offered to a large drug dealer! Fortunately the young man who “took care” of her, treated her well. Labé is full of life and energy. She spent six weeks in quarantine and was found to be in excellent health. She quickly adapted to her new life at the CCC and has discovered happiness in the forest, wild fruits and joys of life in the bush! She is very sociable, she loves to play, she eats everything and has the appetite of an ogre! Tya was recovered in Conakry in early January 2011. She had been held by an expat to “entertain” his daughter who was walking with the little chimp in the market in Conakry, where she was spotted by a former worker of the CCC. Tya was treated well and healthy. She arrived January 6, 2011 and weighed only 5 kg, light as a feather. Tya is adorable and gentle. She has adapted well to rediscovering her natural environment in the bush. Tango, originally called Tamba, arrived June 17, 2010. His name was changed because it was too similar to another CCC sheltered chimpanzee, Samba, who disappeared. An expatriate of Quebec handed over the little chimp to the CCC for fear of getting into trouble with the law. Tango arrived in very good shape. Despite a broken finger, he quickly demonstrated great ability to climb trees, build nests, find food and hunt … green monkeys! Tango was a playful baby and a little temperamental. He has now perfectly adapted to life in the bush and continues to function well. Koumba is a female born June 13, 2007 at the CCC. Her mother, Nikita, was 20 when she gave birth to her. Unfortunately, after a long illness and despite much effort, Nikita died in 2008 to the great despair of the CCC team. Thus, Koumba became an orphan at the age of one year and had to be placed in a group where her peers very quickly helped to mother her. Koumba has developed a very strong character in the group. In January 2011, an adult male escaped and during the incident, Koumba’s hand was severely wounded. Koumba, unfortunately, had not respected the rules of hierarchy and punishment followed… We had to amputate two fingers of her left hand. Despite this accident Koumba, moves very well and does not seem to suffer from her disability. She remains one of the prettiest Somoria chimpanzees. Demou, a young female orphan, arrived in April 2011. The Guinean authorities intercepted just as she was about to be sold in Conakry. Her name means “chimpanzee” in Pulaar, one of the local languages. As Demou’s capture was recent, she was highly skilled in her “wild” abilities. When she arrived, she spent her quarantine with Tya and Tango and took a liking to the small Tya! Since then, she taught her two new friends a lot of wildlife behavior, for example: picking berries, fishing ants and also building nests. Demou’s group changed in August 2012 when she started to become a little bored. She joined Hakim’s group and it was a good fit! We hope she will teach this group all her forest knowledge, essential for their survival. The transmission of knowledge to their age group is particularly crucial. Demou is affectionately known by the whole CCC team as the “little professor”. Flo arrived in August 2007. She is the only survivor of a terrible truck accident. This little chimpanzee was in the company of a truck driver when the truck crashed near the town of Faranah. The truck overturned on the side of the road. Several people died, but Flo miraculously survived without a scratch after being ejected from the truck into a field. The owner of the field knew the CCC through education campaigns and brought her to us in Faranah. She quickly adapted to life at the center. Flo is very independent and spends her time in the trees in search of food. She gets along very well with all her companions, with whom she spends a lot of time playing. After an awareness campaign by the CCC, in the city of Faranah, the owner of Duma introduced himself to the team. He had purchased Duma in Sierra Leone a few months before to “save” him from his poor conditions of captivity. But you should know, buying a chimpanzee only endorses the trafficking of these primates. In June 2007, Duma arrived in poor health: influenza, severe malnutrition, ringworm and extreme fatigue. He spent a month in the quarantine camp with the volunteers so that he could rest and heal from his various infections. Duma means “sweet” in Malinke and the name fits him perfectly. He is very nice and affectionate. He is doing very well in the bush outings and is especially good at using stones to open the shells of certain fruits. He is very advanced compared to his kind in using tools. Lily came to the Center in March 2007; she was particularly small, no taller than a bottle of water. Her story is anything but ordinary. She was close to entering Ourékaba with officers of Forestry, when a severe popular unrest took place in early 2007. So she had to remain with a government agent for almost a month until the people were allowed to move freely again and the CCC team could get to her. She suffered from malnutrition and bronchitis. Lily has quickly adapted to life at the CCC. She is quite independent and full of joie de vivre. Hakim arrived in late April 2006. He lived with Conakry expats and was in good health. Hakim was very clumsy, but has grown rapidly and is now doing very well in the bush: he finds food, makes beautiful nests and is bonding with other members of the group. Hakim is a real clown and his beautiful round eyes give him a very unique look. He has a very endearing personality by being both gentle and playful. Panza arrived in September 2006. He was bought in a Conakry street by a South African man who wanted to “save” him. This man was unaware that buying a baby chimpanzee encourages poaching and capturing other chimpanzees. Panza means “big belly” in Spanish and the name suits him very well! He has an amazing character and has quickly adapted to life in the CCC with his new friends. His group goes out in the bush every day because they still have much to learn! Panza is affectionately known as the “little boss” of the group, because he is often the first to get into mischief! He is small in size compared to the other males of the group, but this has not hindered him at all and his strong character offsets his small size. Kirikou had been left with Ama at the Water and Forests Services, Conakry. Expatriates had abandoned him after their departure from Guinea. For 10 days, he was confined in a container in the midst of a group of generators, scrap and rubbish. He was nourished by some fruit discarded through nearby windows. Finally, in late April 2008, the CCC rescued him. He was very thin and dehydrated. Kirikou presented with rocking behavior, evidence of high psychological distress. He suffered from malnutrition before his arrival at the center and retains the effects of his unhealthy diet with bowed legs and small deformations under his eyes. This does not stop him from climbing trees to play and to look for food with his friends. Kirikou still requires a lot of love. He attracts a lot of tenderness because of his sensitivity and fragility. Ama had been left with Kirikou at the Water and Forests Services in Conakry by a Guinean. His former employers, expatriates, had abandoned them. For 10 days, they were confined in a container in the midst of a group of generators, scrap and rubbish, feeding on fruit that had been thrown through nearby windows. At the end of April 2008, the CCC had recovered Ama in a very poor condition: thin and completely dehydrated. Ama’s growth was stunted and she had small unexplained facial bone proliferations. Her pierced ears demonstrate that she was considered a true living toy. Thanks to the CCC, Ama regained her natural environment and was incorporated into a group of chimpanzees; she has quickly adapted and integrated. Ama is very quiet and sweet. Shelly arrived in August 2006. She was very healthy. Her “owners”, Australian expatriates, financed the construction nursery building because we had no place to properly welcome new chimpanzees. Shelly was treated like a real human baby by her owners: she wore diapers and ate a variety of food but not necessarily food suitable for a chimpanzee. It was difficult to make her understand that she was not human, but she ultimately and very quickly adapted to the bush. Shelly is very soft, cuddly and endearing. At a glance, she looks very sad. She is still quite dependent and demands human attention. Max embodies the will to live and the courage. He had been held by a soldier in Faranah, a city of Guinea. Max was malnourished and suffering from acute gastroenteritis, as well as a gingivitis caused by a fungus that had exposed the roots of all his incisors. He had deep wounds caused by the rope that had been attached to his hips. We were not able to cure all of his ailments that were so critical and pathetic. In July 2005, Max was transferred to the CCC. He allowed us to take charge and gave us his full confidence. The first month, Max was so weak that he stayed lying down for 2 weeks. He was under surveillance 24 hours a day to provide health care and the drugs needed to heal him. Max made a comeback. Unfortunately, he continues to have a significant cardiac problem due to his oral infection and has evident delayed growth compared to chimpanzees his own age. Max became a very sociable, playful, prankster chimp. He has been doing very well in the bush and has an enormous zest for life. Chloe was rescued near Faranah in January 2006 by an Upper Niger National Park guard. A poacher was traveling with her, definitely to sell her as a pet in Faranah or Conakry. When the CCC recovered Chloe, she was about a year old, her capture was fairly recent. She was malnourished but soon regained her strength. After a month in quarantine, Chloe was very well suited to the youth group. She was always very independent and barely remains attached to humans. 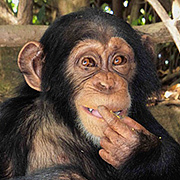 Chloe is a real little chimpanzee, adorable, resourceful and playful. An Australian couple gave Wodo to the CCC in August 2005, after he had lived in their home for 3 months. Wodo means “chimpanzee” in Malinke, one of the languages of Guinea. Upon arrival, Wodo was in perfect health but was very shy. He quickly adapted to life at the CCC with his peers and quickly conquered the forest. He is now an independent, resourceful and mischievous chimpanzee. Danley, real name Dan, was collected by an American who kept him for more than a year. In the words of his owner, he could barely walk. We therefore concluded that he must have been about 6 months old at the time of his capture. In May 2005, he was sent to the Chimpanzee Conservation Centre where he quickly adapted to life with his kind. Dan is a very nice chimp, touching, joking and a rascal. Lobaï was held by a Guinean/Chinese couple. “Lobaïcheng” means “big and strong” in Chinese. Their neighbors alerted us to his presence because his cries were so strong. His “owners” easily agreed to entrust Lobaï with us because he had become too turbulent to live in a house in town. He was in good physical condition but suffered from very marked developmental disturbance characterized by lack of interaction with the environment. He arrived in late April 2006 and has struggled to integrate, swaying back and forth all day. It took a lot of patience and gentleness to help Lobaï fit into life at the center with the other chimpanzees. Today, all developmental disturbances have disappeared and he is perfectly adapted to life in the bush. He is filled with joie de vivre, a prankster, is very nice and has very high intelligence. A guard of the Haut-Niger National Park reported Nelson whereabouts to us in June 2005. At the time he was in the home of a police commissioner who decided to ignore all the country’s laws protecting chimpanzees. He initially wanted to sell Nelson to us, which is, yet again, contrary to Guinean and international laws. The CCC’s refusal to “purchase” Nelson started a long battle and it was not until December 2005 that the little chimpanzee came to CCC in a pitiful state. He was in a very advanced state of malnutrition, almost hairless, burned on the back and frightened of humans. It took a week before he would accept being held in our arms. Upon his first days at the CCC, he would return himself to the small wooden cage that he arrived in, closed the door and huddled under his blanket. After a long period of care and lots of love, Nelson has adapted well to life in the CCC. He is now a beautiful large male, very playful, full of life and becoming more independent. He still has the habit of sucking his lower lip which makes him look so unhappy in some photos. A look which makes our hearts melt as we wonder about how he was abused. Louna belonged to a French expatriate who sent her in a bush taxi to the CCC without informing anyone of the arrival of the little chimpanzee. Thus, her former owner never financially helped the Center and completely unloaded his obligations. Upon arrival at the center in March 2005, she was healthy and psychologically well-balanced. Louna is an angel and wise. She has a very sweet nature and is exceptionally friendly despite having a strong character. Habou was seized in Conakry by the National Director of Water and Forests Deputy, when in late November 2006, a young local proposed selling Habou to him in the street. When the CCC received Habou, he was about 3 years old, had very little hair and was very fearful. He had undoubtedly been a victim of abuse. Upon arrival, Habou had great difficulty assimilating. He was in such a state of emotional distress that he auto- mutilated, bit one of his toes and compulsively tore out his hair. He needed a lot of reassurance. He is still emotionally fragile. There are still circumstances, in times of stress, where he tears out his hair or puts a small stick in his ears. 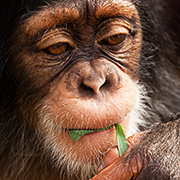 Habou has a strong character and is now well adapted to living with other chimpanzees. In February 2004, after some heated negotiations, Veve was seized in N’zérékoré a city in Guinea, by Tatyana Humle, a primatologist studying chimpanzees in the country. She is named after small bees in the Bossou region. Upon arrival, Veve was very small and was a very playful baby. She was the queen of mischief and already developing her little anarchist side … She quickly adapted to the bush and other chimpanzees. Veve became a large female with developed maternal instincts, although still a little awkward with her fellow babies … She has retained her very endearing character and mischievous personality. In January 2003, Charlotte was seized from a merchant to Kamsar, a town of Guinea. Upon her arrival, she was very young and in good health. However, she had a bullet in the skin of her abdomen, evidence of a violent capture. The vet removed it under local anesthesia, which she kindly let us to treat. Charlotte is very pretty and has often been a princess in the eyes of the males. She has always been very wise and has a very mild and sometimes even timid temperament. Despite her age, she retains the habit of sucking her thumb which makes her even more endearing. Oga came from Mamou, a city that is halfway between Conakry and Faranah. He arrived in September 2004 and joined Vévé in quarantine. He was in good condition. Many infants arrived shortly after and Oga and he played the role of big brother to the younger ones. Oga is extremely nice and affectionate with his friends as well as with humans. Oga has the distinction of having eyes of different colors: he has one blue eye and one brown eye. He is currently being integrated into the adult group. In September 2005, Kindy was given to CCC by a Canadian who had her for the last 2 years. He had bought her to save her without knowing that his action promoted illegal wildlife trade. Upon her arrival, she was very healthy. She quickly adapted to life in CCC and quickly became the group leader while she was in the “youngster” group. Kindy is a female of great gentleness. She is protective, maternal and fairly independent of humans. Nimba was confiscated by agents of Waters and Forests in the Sierra Leone’s Dabola refugee camp in November 2011. The terrible war in Sierra Leone and Liberia had displaced, to Guinea, more than a million refugees fleeing atrocities. Nimba almost died a few weeks after her arrival when violent diarrhea left her completely dehydrated. But with perseverance and love, Nimba survived and has learned all about the life of the CCC chimpanzee. She has taken her first steps, had her first tooth … Nimba has always been the darling of the group because she has a very easy character; she is always in a good mood but does not show this to the males! She is now a young adult perfectly comfortable in her small group. Paco was seized in June 2003 in Conakry by a soldier of the Guinean authorities. Paco was quarantined with 3 young females: Charlotte, Amina and Kyo. He was not accustomed to their attention as they took turns in his arms. Paco bore the scars of his capture: we discovered at least seven pellets in his body, including one that had punctured his eye, his left wrist was broken and was very anemic and skinny. He spent several days eating and resting, and finally he regained a zest for life. Paco is a very gentle chimpanzee, both with his friends and humans. But in recent years he has become a very large male and his blind makes him look like a pirate! He is not the dominant of the group, but it would not be surprising, that if in a short time, he took control. Sita’s story is a tragic one. She was seized from a hotel in Conakry in July 2002 where she was living in a tiny cage. Sita was used to “amuse” and attract customers, some of whom were drinking beer … The owners of the hotel, alerted by Sita’s cries of despair, had rescued her a year earlier, when the neighboring house tried to kill her with a machete to eat her. She had “belonged” to expatriates who had left the country and left behind Sita, without concern for her future. She was probably their “pet” for months! She will always be branded by this time on her life as she lost her left eye in addition to suffering severe psychological damage. Sita always maintains a great softness and rare gentleness with everyone. She remains dominated by all the other chimpanzees. Moka was seized in the Faranah market by the CCC on August 10, 2002, where a poacher was trying to sell him. Upon his arrival, he suffered from malnutrition and severe psychological distress. His name comes from the peculiar color of his face. Caring for Moka showed us his great love of food and need for attention. He is very jealous, does not necessarily express gently, but still very nice. In December 2000, Ced was abandoned at the CCC by a Canadian expatriate. He had been purchased a few weeks earlier in Conakry. Upon arrival, Ced was really sick, he suffered from severe diarrhea and pneumonia. It took him several months to fully heal. Ced has a dominant character even though it is not the largest male, and he clearly shows his peers a very impressive show of force. Ced is very popular with females that he allows to eat at their leisure. He is very distant from humans and does not require any attention from us. Laurence, meanwhile, was not equipped with a collar because she was still growing; the collar might hurt her in the long term. How surprised we were to see Laurence reappear in August 2008, a month after release by the CCC! She returned in great shape, but apparently her freedom did not suit her because she immediately jumped in her old enclosure, at that time occupied by the new group of young adults formed after the departure of the released chimpanzees. She was accepted without any harm. Laurence brought back with her a wild female chimpanzee that we had seen for weeks trailing the CCC. We named this female Loundan (which means “the foreigner” in local language), and she has also very been well suited to the group and surprisingly at captivity! Rocky was abandoned at the CCC in June 2000. He lived in the backyard of German expatriates. He was one of the first infants rescued. Despite some problems integrating, Rocky quickly established himself. He has become a wonderful adult, very nice but he is still a big baby. Mike was seized at the Conakry airport in September 2000 while his “owners” were trying illegally board a flight to Brussels! Mike’s incisor and canine teeth had been pulled out, showing that he must have been biting his “owners” to their dislike. After spending quarantine with Ced, Mike had a very difficult integration to the youth group. He had no understanding of his peers and it took 8 months before he started to feel good about the group. Today Mike is a superb male and plays an important role in the adult group hierarchy. Years of rehabilitation at CCC have erased the pain of his captivity. On October 26, 2009, the CCC team recovered Zoe, a female adult chimpanzee. She lived in a house in Conakry. She was well treated and fed a balanced diet. Zoe was about 6 months when her former owners bought her at a market where she was attached to a truck to be sold as a pet. Zoe had lived for 10 years in the city, in good hygienic conditions, but without a tree on which to climb and no contact with her kind. She did not behave as a chimpanzee and had communication problems with the other chimpanzees, which is a big handicap to group integration and hopefully release one day. She has no problem climbing the trees of her enclosure. Zoe is a stressed chimpanzee and pretty brutal with volunteers. This is certainly due to the radical changes she endured upon arriving at the CCC after 10 years of city life. She needs a lot of attention and has significant psychological scars. Bobo came from a house in Conakry inhabited by expatriates. He lived in a tiny cage where he would pace and bang his head against the bars out of boredom. He was recovered in 1996 when his owner, a missionary, left Guinea. Bobo was in a bad state, he was suffering from a serious skull fracture. It was very difficult to reintroduce him to the other chimpanzees, he was terribly afraid of his peers. He is now a lively chimpanzee and very smart, kind and sociable with the Centre team. He is one of the largest chimpanzees in the sanctuary and weighs about 65kg. Before being recovered by the CCC, Coco lived for 14 years in a hotel in Conakry for the “amusement” of tourists smoking and drinking beer … He was chained by the neck to a tree in the middle of a garbage landfill. In 1995, Coco managed to break his chain and escape. He was severely wounded by a soldier who shot him 5 times. The Director of the CCC, Estelle Raballand, treated him for many months and despite his suffering, Coco was left without aggression. Unfortunately he will remain disabled for life. His left leg is atrophied and his right knee is stuck at a 90 ° angle (his kneecap was destroyed by a bullet). Coco was transferred to CCC in March 2000. Coco is too old to be integrated into a group of chimpanzees. He would not be accepted by the others because of his age and disability. Coco lives alone in a cage and unfortunately cannot go out into the annex of the enclosure because of his multiple escapes. He shares his time with the volunteers who care for him all day. Coco can never be released into the wild because of his disability. Thus, the volunteers have a special relationship with him. He loves to nibbles ears, and in exchange, we nibble his nose gently. In July 2011, Coco was attacked by bees. We recorded more than 1000 stings. Locked in his cage, he had no way to escape the attack. Coco narrowly escaped death for the second time, but his thirst for life enabled him to survive. We are currently struggling to raise funds to expand his cage, which would allow Coco to move more easily and offer him better living conditions. Loundan is very unique because she is a wild female. In 2008, she followed Laurence, who had renounced her freedom, back to the safety of the enclosure. We had seen this wild female hanging around the enclosure and we nicknamed her Loundan (which means “the stranger” in the local language). She is very well suited to the group and surprisingly at the captivity that she preferred! In 2009, she gave birth to a baby girl that we named Balo, the father was probably Ced, the dominant male of the group. Balo succumbed to illness in October 2012. Unfortunately not all chimpanzees have had the chance to be saved and the list of lost is too long. The ones that have forever marked our hearts can be found here.